Dr. Harmik Soukiasian is the director of the Division of Thoracic Surgery and a key member of the Mesothelioma Program at Cedars-Sinai Health System in Los Angeles. At Cedars-Sinai, Soukiasian has affiliations with the Women’s Guild Lung Institute, the Esophageal Center and the Samuel Oschin Cancer Center. He has emerged as one of the surgical leaders at Cedars-Sinai since arriving more than a decade ago. Soukiasian graduated from the nearby Keck School of Medicine at the University of Southern California in 1998 and completed fellowships at UCLA, Cedars-Sinai and the University of Pittsburgh Medical Center. In 2018, he presented a groundbreaking study at the American Association for Thoracic Surgery annual meeting that documented the benefits of early intervention for non-small cell lung cancers. He was part of the first surgical team on the West Coast to use a special implanted device to stimulate respiratory muscles in the chest for patients suffering from Lou Gehrig’s disease. The surgery came just days after approval from the Food and Drug Association. His clinical interests include photodynamic therapy, video-assisted thoracoscopic surgery, radiofrequency ablation, esophageal cancers, lung cancers, lung volume reduction surgery and pleural mesothelioma. 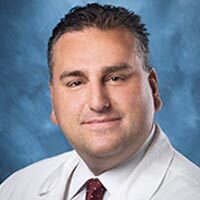 He is the lead surgeon in Cedars-Sinai’s Mesothelioma Program, which includes disease-specific expertise in medical oncology, radiation oncology, hematology, pulmonary medicine and research. The Mesotheloma Program offers services on everything from early-detection tests to novel treatments. It includes clinical trials and a tumor board that meets to develop a personalized treatment plan for every patient. The program also is part of the Supportive Care Medicine Program at Cedars-Sinai that assists patients with post-surgery rehabilitation, spiritual care, clinical nutrition, and psychiatry services, along with palliative care when appropriate. Soukiasian also has an extensive research background. He has written about lung cancer in nonsmoking women and the specific molecular and pathological features that have led to improved treatment. Disclaimer: Dr. Harmik Soukiasian has no professional affiliation with Asbestos.com. Ingram, I. (2018, May 1). Each Week of Surgical Delay May Increase NSCLC Upstaging. Cedars-Sinai. (n.d.). Harmik J. Soukiasian, MD.